For me, the convention season is just about to start. As comic conventions get more popular, more and more people are attending each year that have never been to a comic convention before. I’ll be heading to Salt Lake Comic Con’s FanXperience later this month, and have plans to attend Denver Comic Con and SLCC’s main convention in September, later this year. There will probably be some lines. Get there early if you can, or arrive later and stay into the evening. I’ve been to a couple smaller cons where there was nearly no wait time, but when you’re attending a convention that has over 100,000 attendees, there’s gonna be some down time. If you want to avoid these lines, order your tickets early (Most conventions will send out your badges in advance, if you order early enough.) or register early if you can. If you don’t, you may have to wait in line to register and then wait in line to get it. Save yourself the headache and have your badge ready. SLCC’s events also have a wrist band that you register, which made things really easy last year. Once the doors opened, I was in almost instantly. Most conventions offer daily passes, an multi-days pass, and a VIP pass. SLCC does their passes a little differently, where they have daily passes, a multipass that gets you in all 3 days, a “gold” pass which gets you in all 3 days and provides some added perks, and the VIP passes. Personally, I get a gold pass. I don’t usually see a lot of celebrities, so a VIP pass wouldn’t be utilized by me. If you want lots of autographs and pictures with celebs, a VIP pass is worth it, because you’ll be in the VIP line, which tends to have a shorter wait time. It’s best to look for a pass that fits what you want to do best, and make the decision based on that. Artist Alley – An area where independent artists, writers, crafters and small publishing companies generally have booths. Most of these creators paid for their booths out of pocket, so consider supporting them if you can. You’ll find some really stunning art, new reading materials and other fun stuff here. Vendors – This is usually next to where Artist Alley is, but instead of independent artists, it’s more likely you will find companies/stores. You’ll find just about everything from T-shirts to costume supplies in this area. And of course, comics. Lots of comic stores. Special Displays – These tend to be super fun places to get pictures. Things like Star Wars sets, famous cars from different movies, the Iron Throne and other awesome displays have been at some of the comic conventions I’ve attended. Salt Lake Comic Con also tends to have the costuming groups near these displays, so you can get a picture with a Jedi, a Mandolorian Merc (Like Boba Fett) or with a superhero. Many of these groups do charity work, so keep that in mind when you visit them. Celebrities – Each celebrity has a booth where they do signings. Prices vary, so be sure to check your convention site to find out how much an autograph will be. Some conventions allow you to pay in cash at the convention, while others do online only autographs. Photo Ops – The Photo Op area tends to be the most mysterious part of a comic convention, since it’s all curtained off. There is an area for people to line up who have purchased photo ops, and usually a customer service table where you can buy a photo op or buy additional prints There’s usually an area where the celebrity is, and you are shuffled into that part of the booth, a shot is snapped, and then you’re done. It’s a very quick process, so keep that in mind. Panels – There are usually lots of panels to go to about a range of subjects. Be sure to check out the convention’s programming guide, so that you can find out which ones you want to go to. What about those folks in costume? I just saw Batman and I’d love a picture! Ask before taking a photo. I’ve had it happen a few times, a shy person likes my costume but doesn’t ask me to take a picture. They hold up their phone and snap a shot as I walk by, which probably results in a picture that doesn’t look great. I usually stop and ask if they want a picture, or if they’d like to take a picture with me. One of my FAVORITE parts of wearing a costume is posing with other fans. Unless I’m in a super hurry, I will stop and pose for/with you, as long as you ask politely. Cosplayers want the photos you take to look awesome! Don’t be afraid to ask for a picture. Ask before touching their costume, or hugging them. My husband wears a Captain America costume and he’s had more than one fan want to hug him in it. He’s fine with a hug and the hug isn’t going to damage his costume, so it isn’t usually a problem. If he were wearing foam armor, or something more elaborate than fabric, it might be a bit more of an issue. It’s a total bummer for a cosplayer when something breaks, so be polite and careful, and respect the work the cosplayer has put into building their costume. Again, just ask, most cosplayers want to share how they made something and will either let you touch it, or tell you how they made it. If they are eating, resting, or look like they are taking a break, considering waiting to ask them for a picture. I’ve been approached before and usually I’ll still get up/ stop eating to pose for a picture, but it’s also nice when people are respectful of break time. Conventions are usually filled with a lot of walking and not all costumes are comfortable. Cosplayers dress up because they love the character. They usually aren’t paid. Except for a few professional cosplayers, most people dressed up at a convention did not get paid to be there. They likely bought a pass just like you did. So keep that in mind when you interact with them. And that gives you the basics! If you have a question, feel free to leave it in the comments and I’ll do my best to answer it. Salt Lake Comic Con Part 3: Chris Evans and this Con was special to me. In the time I’ve been attending comic conventions, I’ve only ever gotten one photo op with a celebrity. It was last year with Eliza Dushku, someone I have been a fan of for years. I usually go to conventions to show off my cosplay and network with other writers and artists, as well as check out panels on writing. This year, I had amazing friends who let me jump in on their photo op with Chris Evans. I also was lucky enough to attend his panel. I am a huge fan of Captain America, both in the comics and in the movies, so it was an amazing experience to fill my Saturday with these events. Salt Lake Comic Con held a lottery for tickets to the panel. My husband and I won one entry between us, and he was happy to let me go and see one of my favorite actors. I know a lot of people were frustrated with the lottery system, but it I think it was better than many people camping all night and from what I heard all of the people who joined the standby line were able to get in. Also, gracious fans that were not going to use their tickets were all over the SLCC Facebook page ready to share and trade their tickets, for free (one person did attempt to sell their pass, but they were quickly set upon by a horde of people telling them how rude that was). Chris discussed both the movies and his issues with anxiety. My favorite thing he mentioned was focusing on gratitude and being thankful for the things you have. He also spoke about quieting your mind and taking time each day to do so. As someone with anxiety, it was amazing to hear him share some of his struggles and triumphs. It also made meeting him for a few moments later in the day all that special. When I said “Thank you so much” for the photo op, he replied with “Thank you” as well with a smile on his face. His sincerity was very touching. I got to spend a lot of my time at this convention with new friends and some old friends. Honestly, that is what made it so much fun for me. Connecting with people. I recognized a Kate Bishop cosplay and she immediately ran up and hugged me. Because the convention was better organized and overall better done than the previous two years, I think it made for an easy way to have fun. Each day was a blast and I could not of had more fun. I’ve seen posts complaining about lines and crowds, but any time you have an event with literally a hundred thousand people, these issues are going to arise. Try to keep a good attitude, bring some friends with you, and just have a blast. I would absolutely recommend this convention if you are looking to attend a larger convention with a focus on pop culture. They don’t have quite the emphasis on actual comic books (Writers, artists, etc) that I have seen at other cons, so I may not attend for that, but they do have a wonderful Artist Alley section filled with people either in the industry or trying to break in. What was your favorite thing about the convention if you attended? Is there anything else you’d like to know about it? Let me know in the comments and I’ll do my best to provide you with anymore info I have. 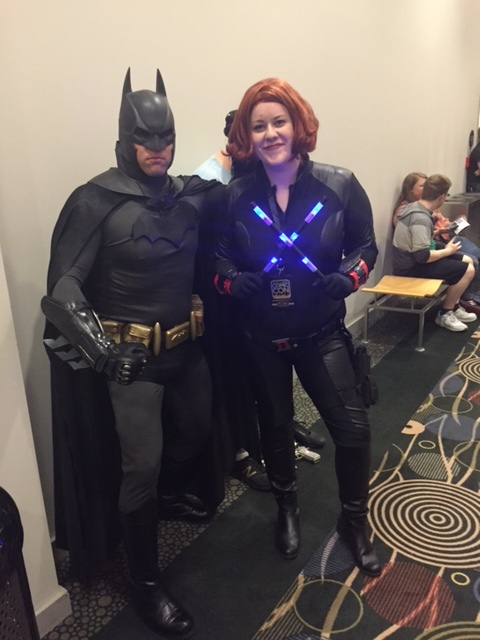 Salt Lake Comic Con Part 2: Cosplay Experience and Tips. Each year, Salt Lake Comic Con is a little like Christmas for me when it comes to cosplay. I’m both Santa and the little kid getting the presents. I spend months working on costumes for my husband and I, and then we get to debut them. This year was a little different because we also participated in the Cosplay Contest with a group of friends. Here are some tips if you’re cosplaying a large convention for the first time, things that I have learned along the way. People may try to take your picture. If you see them trying to snap a shot, tell them you’re totally willing to pose for them. This gives them a better picture and hopefully you’ll find it later and be able to see how awesome you looked. I’ve noticed more so at Salt Lake Comic Con than other conventions I attend, people may not ask you to take your picture. They may do it when you’re eating, or waiting in line. If you see them, just ask if you can pose. I do not think most of these people are attempting to be rude or snap a sneak shot, they just don’t realize the etiquette involved. People may not try to take your picture. When my husband I dress up as characters from the Marvel Movies, we often get stopped a lot. When we dress up as our favorites from the comics, sometimes we don’t get stopped at all. My husband has a Captain America costume that is very popular, and sometimes they will ask for a picture of just him and not me. Everyone likes different things and it’s good to remember that cosplay is about your love for the character. Even if not a single person knows who you are, try to have fun with it. Try not to take pictures in crowded areas. We often get stopped in the middle of the floor, as we are walking to and from our destinations. I always try to say “Hey, can we go over there?” or “Can we swing to the side?” so that we aren’t blocking the flow of traffic. 9 times of 10 the person is happy to move a little as long as they get the picture. It keeps things moving and doesn’t cause a traffic jam. Plan ahead and plan that part of your costume will break or you something will go wrong. I bring a little repair kit in case of emergency. It has moleskin, bandaids, super glue, string, stain wipes and several other things I might need. In the middle of the con, my husband’s boots started to break. We were able to use super glue to save them and get them through the con. Salt Lake Comic Con actually has a costume repair booth, which I utilized on the second day. My red Fedora kept falling off. They helped me hot glue in loops so I could bobby pin it to my wig. It was a life saver. I definitely would have lost my hat without their help. I also brought flip flops so I could pull off my cosplay shoes whenever I needed to move or at the end of the day. One thing to be careful with: If your feet are swelling from all the walking, you may not want to take your cosplay shoes off. Your feet can swell enough that your shoes will no longer fit. Plan ahead and get comfortable shoes (I use gel inserts and other helpful things for comfort and to prevent rubbing) because if your feet are done at Comic Con, you might be done too. Lastly, consider entering the cosplay contest. But also be aware that it will take up a chunk of your time. They had pre-judging a week before the contest, which would certainly save you some time on Saturday. We attended judging the day of, so that took up some of our time. From there, most of our evening was taken up by the contest, since we found out we were lucky enough to make it in. Just try to have fun with the contest. I had a lot more fun just enjoying being on stage and enjoying seeing the amazing costumes up close, than I would have if I stressed over winning. What about you? Any tips you would share with cosplayers about this and other conventions? Please leave them in the comments below! I’d love to hear your thoughts. Part 3 is going to be full of a lot of Chris Evans and what made Comic Con special for me this time around. See you then! I’ve attended every Salt Lake Comic Con since they began three years ago, each one had its issues, but I can definitely say that this year was the best so far. Not only due to the guests, but also due to the organization of lines and such. My husband and I have tried to get down early on Wednesday night so we could register our passes, but this year that was not necessary as they had wrist bands we could pre-register. Coming from out of state, this was a huge benefit. The only snafu we faced was on the first day, when the volunteers had our line for VIP/Gold move forward and then opened doors behind us, causing many people pretty far behind us to rush the doors. It truth, it probably only cost us a couple of minutes, but was still a little frustrating. I think the thing that truly helps the most in times like this is a positive attitude. Comic Conventions are a busy place filled with lots and lots of people. Unless the error is truly bad, I try to give the volunteers some slack, they are doing the best they can. If you want to see areas like Artist Alley and the Vendors, I would recommend getting at least a Gold pass. It’s not much more than the multi-pass and you get on the floor an hour earlier than General Admission. We were able to walk through Artist Alley, say “Hi” to my artist friends and buy prints and souvenirs before the floor got too crowded. I would also leave some things for the second day. The first day everything is shiny and new and everyone rushes to get to it. Unless you want something that might sell out, take your time. Lines for the vendors and such were actually a bit smaller on Friday. The Funko Pop booth had a huge line the first day for the limited edition stuff they were selling, but my husband and I waited until the second day to go through that line and waited only 5 minutes. I got my Black Widow doll and got out of there pretty quickly. If you are buying prints, keep an eye out for the protective case booths. They aren’t too expensive and they give you piece of mind that the awesome piece you just bought isn’t going to be destroyed as you try to get it through the con and to the car. I did not buy them for my art the first few conventions I attended, and I regret it. Too many times something go bent or broken. You can only attend one day? Go on Friday. Each year I think that Thursday will probably be the most calm of the days, and each year Friday seems to be. I think that most people think that the first day of the con will be quiet, so they get passes for that day. The other advantage to attending on Friday is that many of the celebrities, vendors and artists are there. Salt Lake is a bit different than most other cons that run Friday-Sunday, so sometimes Celebs do not get until Friday. Did you go? Do you have any awesome advice you would like to share? Please do! I’d love to hear your comments! My next post will be about Cosplay at the Con and my tips and tricks.